Have you ever tried your best but still didn’t reach your goals? What happened? Didn’t you work hard enough? Is there something wrong with your goals? 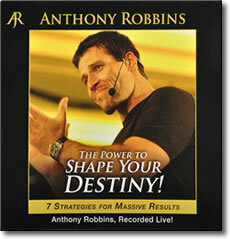 Anthony Robbins has been where you are. He understands the struggles and frustrations that can accompany any attempt to improve and grow. He also knows the unmatched excitement and fulfillment that comes from actually reaching your goals. Tony can teach you how to shape your future through the power of purposeful goals by tapping into qualities that you already have inside of you. Whether you want to advance your career, lose weight, improve your relationships, see the world, or just have time to pursue your favorite hobby, the time to begin getting what you want is now. This program will show you what has been holding you back in the past, and help you to break through to new levels of achievement. Anthony Robbins will give you the skills and motivation you need to make your life truly extraordinary. This program will give you that extra boost to put you over the top. Don’t allow one more moment to pass you by. Start living the dream today.